Relax -- this place isn't what you think, assuming, like most people, you thought it was where totally messed up scientists tried to make people eat Caucasians. 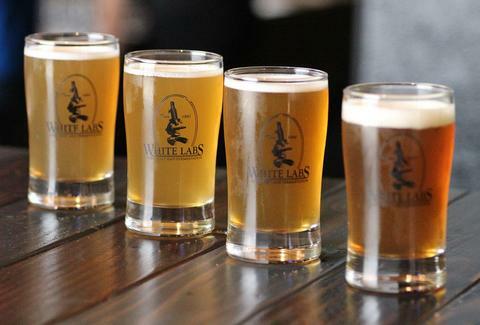 Instead, White Labs keeps brewers awash in the eukaryotic, sugar-gobbling bacteria necessary to impart suds with alcohol. They've now started brewing their own swill (IPAs, stouts, collabs with local breweries, etc), keeping everything constant but the yeast, resulting in several versions of the same beer so visitors can get a better understanding of flavor profile and effect in their freshly minted tasting room featuring a 32-tap, three-cask system and chandeliers made from Erlenmeyer flasks. San Diego Super Yeast: A favorite of home-brewers, this hometown hero balances IPA hops and malt for a more mild, well-balanced brew, and has the added benefit of working extremely fast, despite that going against every single principle this city was founded upon. Edinburgh Ale Yeast: The Scottish stuff almost completely mutes any hops, leaving the IPA at its sweetest and fruitiest, but, again, not in the way you think. Not that there's anything wrong with that.